You're back to work and it's 1pm in the afternoon. Your lunch is sitting just about right, part 2 of your day is about to begin. But don't fret, in fact - rejoice!!! Tune in to the Whistler FM Long Run, each weekday at 1PM precisely (ish) - for one full hour of Whistler FM music to help you get into your afternoon and almost - halfway - to Apres. The Whistler FM Long Run is fueled by TaG Cycling. Become a better rider with training that never stops. 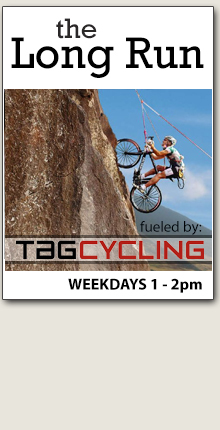 Join TaG Cycling for indoor and outdoor training with select workouts designed to improve your fitness and develop specific physiological systems that prepare you for the demands of cycling and many other sports. The indoor bikes we train with enable us to share with you decades of Olympic training using Wattage, and Cadence. Wattage is a measure of Power. Cadence is leg speed and an important component of generating this power. The workout is tailored to your individual needs by offering a fitness test called a Maximum Aerobic Power (MAP) test (after an orientation session). This test is not to determine if you are fit, but rather to determine the wattage's that apply to you personally, which will improve your fitness. We have seen improvements of over 30% in 12 weeks with our programs. Now with three locations: Whistler, North Vancouver and Vancouver. The Long Run, only on 101.5 Whistler FM.